When people hear of or read about cancer, cancer of the eye is usually not the first form of the disease that springs to mind. This may be due to a lack of awareness or because the media and hospitals report on or have screening facilities for many of the other forms. However, having even a basic knowledge and awareness of the condition will be beneficial in identifying and treating the disease. The symptoms of eye cancer can go unnoticeable for some time as some of them happen to us on a regular basis and may be easily mistaken for other things. For example, eye watering can be a sign that something is wrong, but many of us will put it down to having a cold, the weather, the environment, an allergy or a simple irritation to the eye. If you have unexplained watering that lasts for more than a few days, please see your optician as an eye examination can help determine the cause even if it is something totally different to cancer such as a small foreign body in the eye. As cancer of eye usually means a tumour has grown in the eye area, any obvious growths in the eye or in the surrounding area should be explored. This can even include the actual eye itself if it appears to bulge and be uncomfortable; it is unlikely that you will have a growth in both eyes so any occurrence in only one eye may be a sign, although it may also mean something else is going on. Any loss of vision or visual disturbances can be a sign that something is wrong. As these symptoms occur in many different eye conditions, do not automatically assume and worry that you have a tumour as it is very likely that it is caused by something far less sinister. 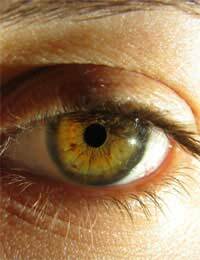 There are some other less usual signs of eye cancer such as having a discolouration or dark spot in the eye. This may be seen when looking in the mirror or by someone else. The discolouration may not only appear as a spot but may be seen in the iris, particularly when subjected to bright light such as a flash of a camera. Many eye problems are picked up when people notice strange features of the eyes seen on photographs. If you have any visual disturbances such as wavy lines or seeing spots, this is normally a sign of age related eye problems and should be seen by your optician,. However if you are suffering from any of the other symptoms you really should make an appointment sooner rather than later to determine the cause. As with most forms of early cancer, the occurrence of pain is very rare. Eye cancer usually only causes pain in the eye area if it is fairly well developed and is infringing on other parts of the anatomy so again, if you have pain the chances of it being from a malignant growth are very small and often something less severe is to blame. Eye cancer is a very serious condition and can risk sight in the affected eye among other things and must be detected early in order to get prompt treatment and prevent long term health problems. Make sure you have regular eye tests and report any visual changes to either your optician or your GP who can make a referral to a specialist who can make a closer assessment of your health.